Money Bagg Yo is an artist signed to popular rapper Yo Gotti‘s record label, CMG Records. Two people were shot – one in the head – last night at the Thomas Edison rest stop on the Turnpike. 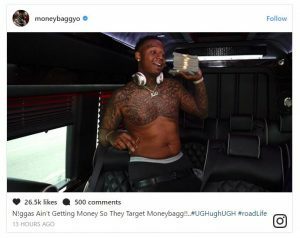 Police questioned rapper Money Bagg Yo last night in New Jersey after a shooting erupted on the New Jersey Turnpike last night (August 19). Several witnesses to the shooting said Money Bagg Yo, who performed in Newark, New Jersey last night, was among the people being questioned by police. Money Bagg and his associates, who were not handcuffed, were seen being escorted to police cars. As of press time, it is unclear what if Money Bagg Yo and his associates were involved in the shooting, or if they were witnesses or victims of the violence. Both victims were alive and alert at the scene, according to local reports.